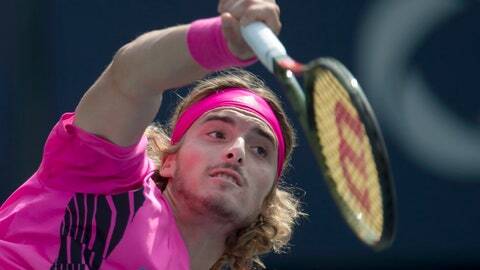 Tsitsipas, who will be 20 on Sunday, will face the winner of the late match between top-ranked Rafael Nadal and Karen Khachanov. Tsitsipas beat the fourth-seeded Anderson after topping seventh-seeded Dominic Thiem, ninth-seeded Novak Djokovic and second-seeded defending champion Alexander Zverev to reach his first ATP World Tour Masters 1000 semifinal. Tsitsipas fired an ace at 7-7 before converting his third match point of the deciding tiebreaker when Anderson’s return sailed long. The South African had a match point of his own at 7-6, but Tsitsipas came through with a brilliant backhand crosscourt winner to pull even. Tsitsipas is attempting to become the first player since Albert Portas at Hamburg in 2001 to win his first ATP World Tour title at a Masters 1000 event. Ranked 27th, Tsitsipas would jump 12th with a victory Sunday and to 15th with a loss when the new rankings are released Monday. Nadal beat Tsitsipas in April in the Barcelona Open final.